Yeah, there aren’t any brilliant photos of these because almost as soon as I’d finished making them they had been eaten. They are seriously delicious. Anyway. You know that website I edit, Kitchen Bitching? Well, recently we were sent a press release about the Spring-A-Leek competition. Basically, they were looking for your best leek recipes. I love leeks, as my huge collection of leek recipes shows, and so I was raring to have a go. When creating this recipe, I used a very simple thought process. I picked the foods that I loved the most and combined them. 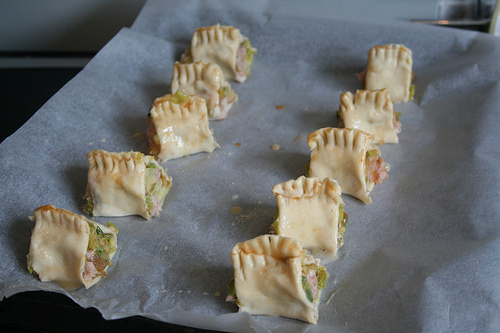 Pastry, leek, mango and sausage meat are very high on my list of favourite foods, if not straight in at the top, so I decided to make these. 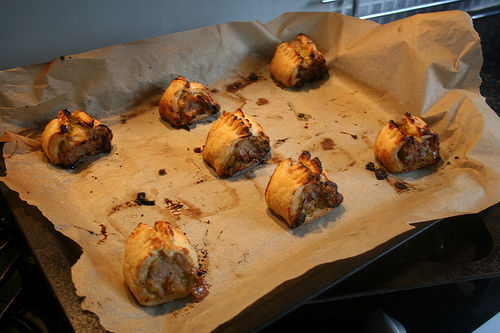 They’re basically posh little sausage rolls, but they’re very nice posh little sausage rolls. 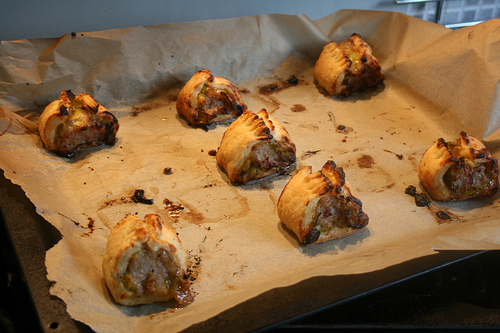 You can, if you like, skip the majority of this recipe and use ready-to-roll puff pastry. But you know what? It seriously isn’t that hard making pastry. And the pride you’ll get from biting into your own crispy-on-the-outside soft-on-the-inside multi layered pastry is hard to beat. Promise. But for those who are still scared of pastry making, I’ve taken it really slowly and taken lots of lots of photos. Don’t be scared, just give it a go. So. Sieve the flour into a bowl and stir in the salt. Cut 25g of the butter into cubes and gently rub in with your fingertips until it looks a bit like very fine, very white breadcrumbs. 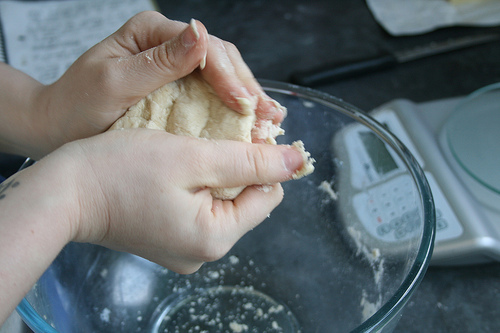 Then add 70ml of cold water and mix using your hands until you get a dough. Don’t worry if it feels a bit moist. 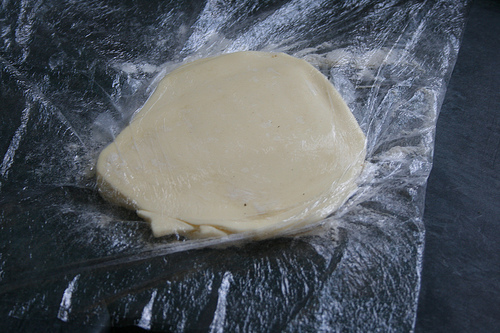 Slash the top of the dough a few times, wrap in clingfilm and chill in the fridge for 20 minutes. Whilst it’s chilling, sort out your butter. 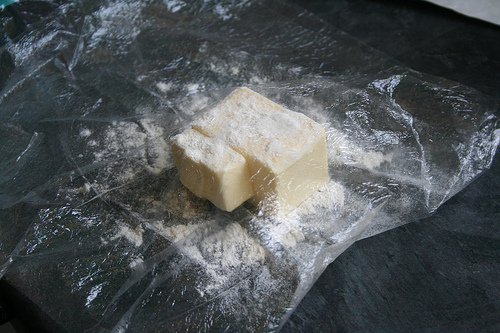 Sprinkle flour on it and put between two pieces of clingfilm, or one large piece folded over. Gently bash it with a rolling pin until it’s half as thick as it was. 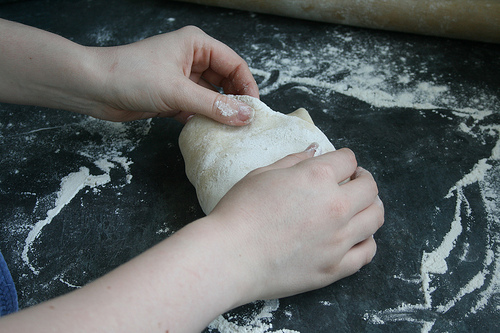 …sprinkle on some flour and bash again. Keep doing this until you have some very pliable (but still cold) butter. 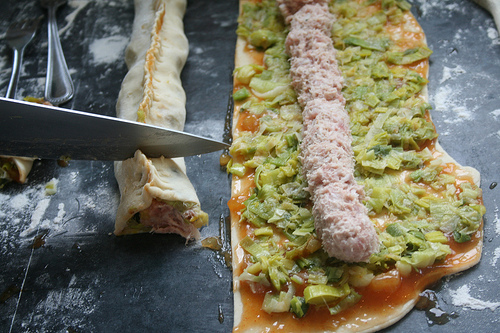 Then roll it to a 15cm square, wrap it up and leave it until your pastry is ready. 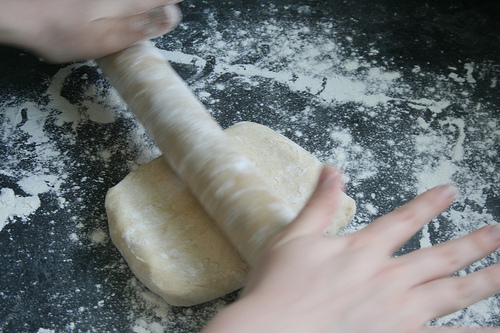 When your pastry is ready, you need to roll it on a floured surface so that is has a space in the middle large enough for your butter to sit in but then four flaps stretching out from the top, bottom, left and right, large enough to be folded in to cover the butter. Sit your little package of butter in the centre and fold the flaps over. Seal the edges carefully and well — you don’t want the butter to come out on the next bit. 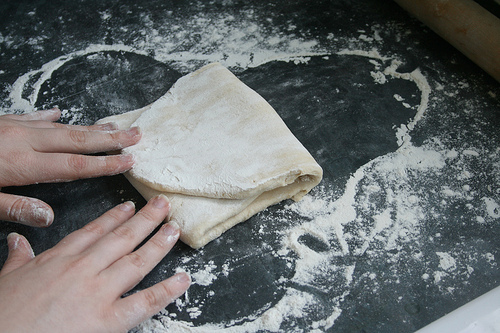 Flip the dough over — add more flour to the worksurface if you need to — and very gently roll it out. You need to make sure that you keep the butter in. …and the top third over that. 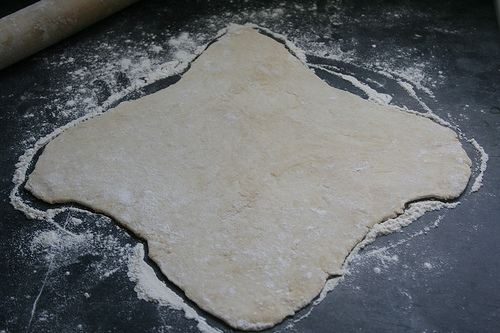 Turn the dough a quarter turn clockwise. 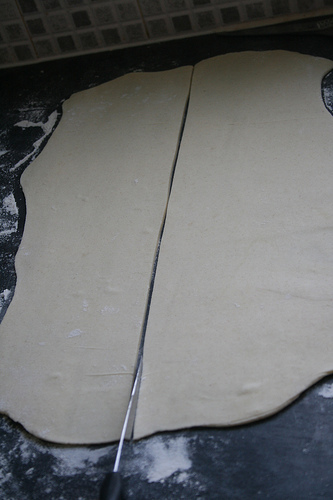 Seal the edges by pinching/pressing with a rolling pin, and then repeat the previous steps — roll out to a long thin rectangle, fold the bottom third over the centre and the top third over that, seal the edges. 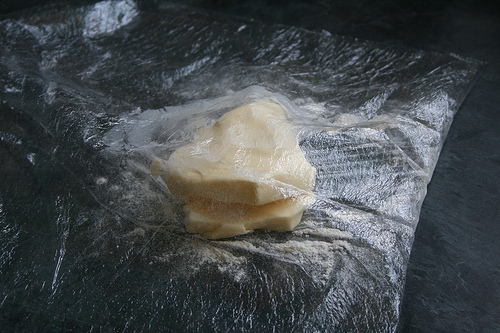 Wrap the dough in clingfilm and chill it for another 20 minutes. 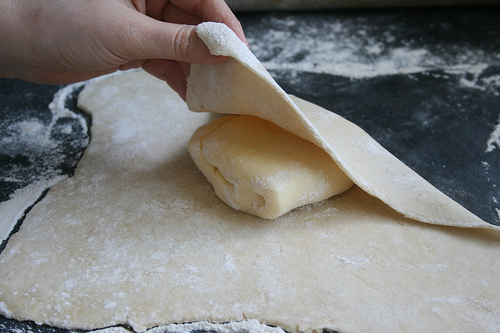 After those 20 minutes, roll-out your pastry and fold it over twice. 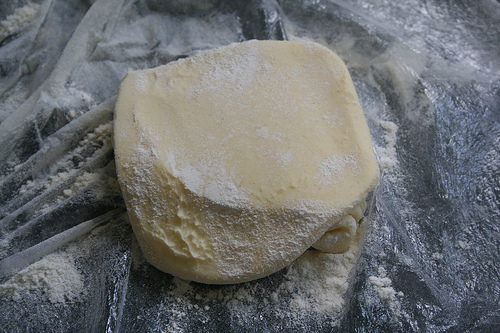 Chill for another 20 minutes, then roll-out your pastry and fold it over twice again. By the end, you should have done the roll-it-out-fold-it-over-turn-it-seal-it process six times. 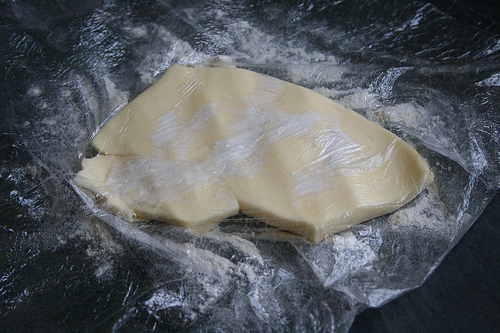 Then chill your pastry for 15 minutes. Whilst all this chilling is happening, you might as well make your filling. 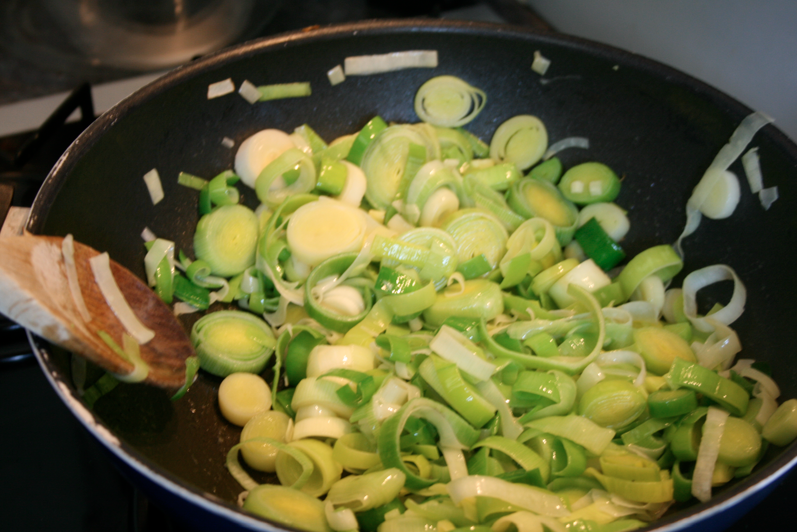 Melt a large knob of butter in a deep frying pan and add the leeks. Fry for 20-30 minutes until they’re soft and falling apart. Now you’re ready to make your folls. 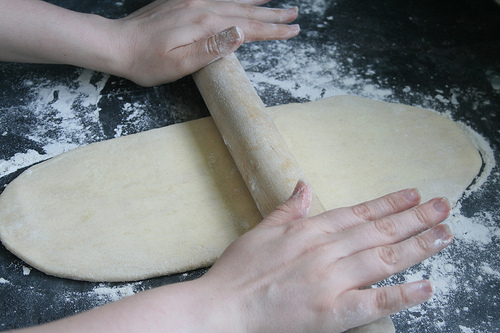 Pre-heat the oven to 225C and roll your pastry on a floured surface until it’s about a metre long and 25cm wide. Slice down the middle to get long, thin rectangles. Slather these rectangles in a fairly thick layer of mango chutney. I used some I got from a little independent business at the Good Food show, but shop bought it fine. 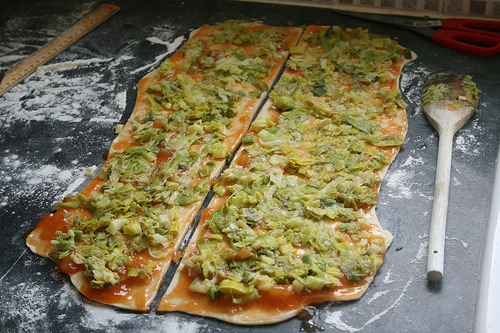 Patak’s is particularly good (I love mango chutney…) Then divide the leeks and spread evenly over the top. You’d probably be better leaving more of a border on the longer sides than I did here — I’ll explain why in a second. 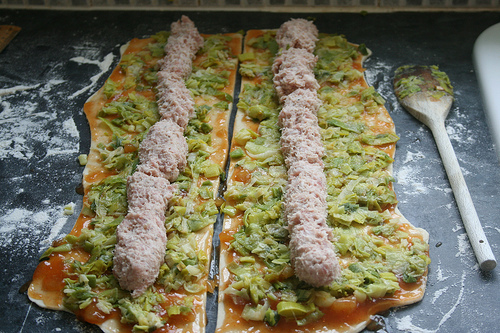 Arrange the sausage meat in two strips down the centre of each rectangle. If you left a border, whisk up an egg and paint one side of the border with egg wash to help it stick to the other side. 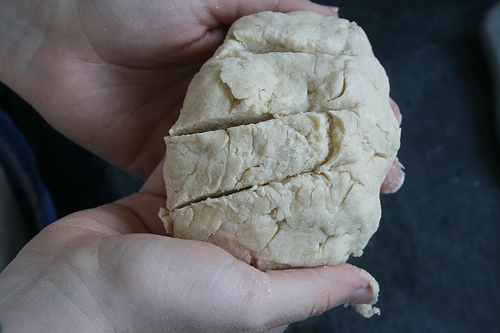 Either way, pinch the two long sides together to cover the sausage meat and use two forks pressing on each side of the top of the pastry to “crimp” it. Then trim the ends and slice into chunks. 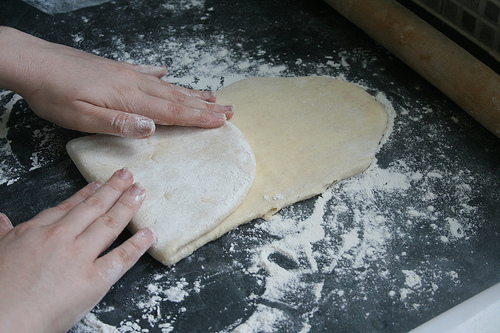 Remember that the pastry will puff up in the oven so they don’t need to be too big.